Michael Rockefeller was the youngest son of the famed New York Rockefellers. A graduate of Harvard, he journeyed to New Guinea on an expedition for the Peabody Museum of Archaeology and Ethnology to study the Dani tribe. He made a brief diversion to make contact with the Asmat in southern New Guinea—their art had captured his imagination. After returning to the states with the expedition, he would return to the Asmat on his own. And he would disappear. There are two theories concerning Rockefeller's disappearance: he drowned or was killed by the cannibalistic Asmat. Neither have ever been proven conclusively. In 1961, Michael Rockefeller was presumed dead. The Man Who Ate Michael Rockefeller considers the latter scenario. 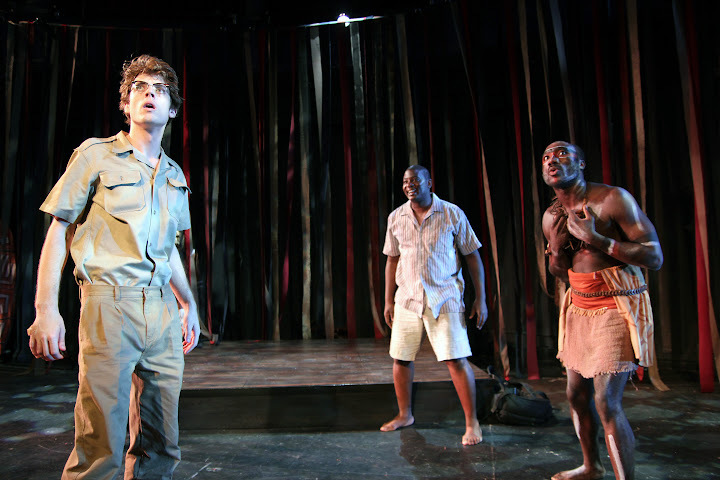 Told from the perspective of Designing Man (Daniel Morgan Shelley), whose creations attracted Rockefeller to the Asmat and caused him to seek them out, and his age-mate, Half-Moon (David King), the audience meets the cultured New Yorker and Harvard graduate in a state of utter awkwardness. We see Rockefeller and others like him as the Asmat and other colonial subjects must have viewed these interlopers: shameless and clumsy. As a result, this story firmly belongs to the Asmat, a feat that is seamlessly accomplished by director Alfred Preisser: Shelley and King masterfully switch dialects to anchor the tale in New Guinea. Half-Moon and I have seen paper before. We both despise it’s uselessness and Rockefeller’s love for it made him, among other things, a fool. Also, that he would own a billion of anything, let alone papers, was a lunacy of surplus. One of the first things visitors learn here is that in Irian Jaya nobody owns more than the eye can absorb in a glance. T'is quite a commentary on Western society! Rockefeller is taken to a visitor's feast, after which he strikes a deal with the Asmat for tobacco and pants in exchange for carvings from Designing Man. He leaves, but not before exchanging gifts with Designing Man in an act of unadulterated brotherhood. However when Rockefeller leaves, the Governor dies and contact with Rockefeller is implicated. To restore balance to the tribe, Designing Man must kill him when he returns. The play traces this conflict in a very real way. It is no secret that colonial contact was not a pretty chapter in the history of expansion, but often the stories that emerge focus exclusively on the wronged subjects of these actions. While the themes of colonialism are ever present in The Man Who Ate Michael Rockefeller (e.g., mention of the Dutch, missionaries, the mannerisms of Bringing Man), it is the relationships that are important in this story—and the ways they are woven to create the fabric of society. This is a story of disruptions within the personal and social networks of all the parties in the meeting. Let me tell you something about our village. It sits in a clearing just deep enough in the forest that we can’t see the water. We have eighteen huts, identically cylindrical with pointed, round roofs, every one raised on stilts and made of grass and sticks and vine. Except for one – the long feasting hall where we took Michael Rockefeller and his retinue. By the time Bringing Man, Half Moon, and I had unloaded their gear, the air was darkening. My neighbors had gotten a fire roaring in the center of the village. It was a decent blaze, with all manner of edible bugs swirling above the flames. There is no word in the Asmat language for what the missionaries call “love.” We’ve always had some inkling of the concept, though—even without a term making it solid. The death of Rockefeller would undo some of this change, but Designing Man and the Asmat find that some changes are irrevocable. Though Rockefeller is ultimately killed when he returns—the issue of cannibalism remains a mystery—his wonder and appreciation for the Asmat lifestyle does not leave Designing Man, who holds on to the idea of Love. The balance that is restored to the Asmat cannot ever achieve what was once the norm—the relationship between the age-mates Designing Man and Half Moon is forever changed. And the audience is made to feel the genuine impact of contact with the Other: the ways in which it brings about change on the individual level, which makes this a very personal encounter. Anthropologists often wonder at the impact they have on the people with whom they live with and study. We know it is nearly impossible not to leave traces of ourselves behind in the field—to change and to be changed by the lives we touch. The legacy of colonialism has long been a sore point in history. The Man Who Ate Michael Rockefeller confronts this wound in a very direct way, and provides a valuable lesson for anthropologists: We can't necessarily control the results of our "touch," but we can try to make that point of contact as meaningful as possible, remembering that the individual experiences will be a very real part of the legacy we leave behind. We become a part of the delicate balance of the network, which shifts and resettles around us.